I live in a small town near Manchester - hoping to move to the city very soon! I have experience in Fashion Retail, garment construction and some experience in Visual Merchandising. I have a level 1 Certificate in Fashion and Textiles. Maxi dresses, lace up boots, stack heels, punk fashion, motorcycle influenced clothing, clogs, lace, wide leg pants, jumpsuits, playsuits, crop tops, rolled up skinnies, neon accessories. CHECK OUT FASHIONJUNKDAILY.BLOGSPOT.COM AND FOLLOW! FASHION, PERSONAL STYLE, NEWS AND MORE! CHECK IT OUT PLEASE AND FOLLOW! 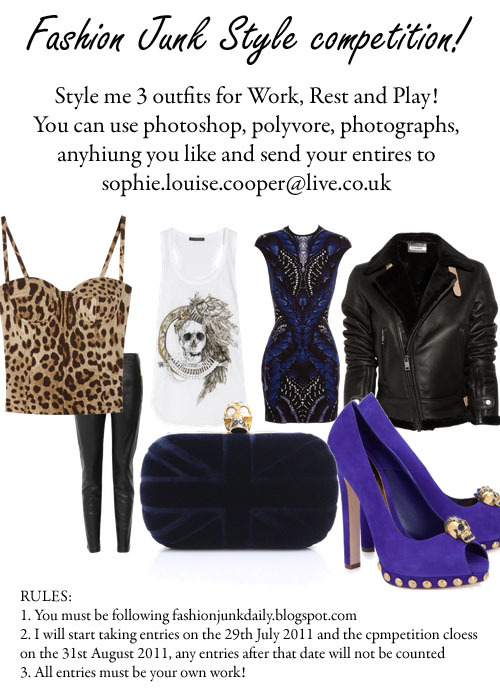 FASHIONJUNK ON TWITTER: FOLLOW @SOPHIEFJD FOR OUTFIT UPDATES, PERSONAL POSTS AND NEWS! Welcome to the Fashion Industry Network. If you have any questions about the site, please do not hesitate to let me know.